Maybe this will help some people understand: I am an author of (4) four published Christian books and as I was writing my second book, I stopped to get something to eat. When I returned to the computer, a complete paragraph was typed on my computer screen. I know that I did not type the paragraph and the words are scripture found in Proverbs but not in this order. These words help clarify the authority I use to write or to say anything in reference to the Spirit of God. “Wisdom is shouts in the streets…Come here and listen to me; I’ll pour out the spirit of wisdom upon you and make you wise. Written by the Holy Spirit. 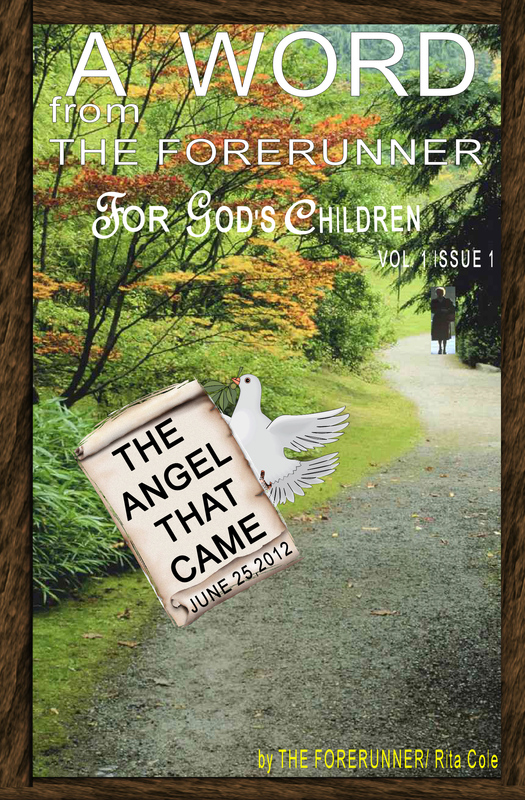 About two years ago, God changed my name to “The Forerunner”. A Forerunner for God’s Word. 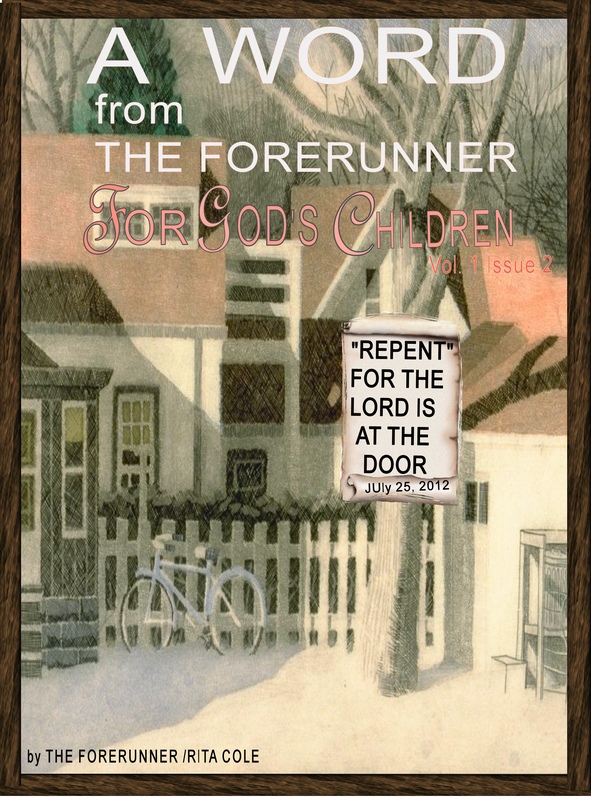 A Forerunner leads people back to God’s word – to the Bible. Read God’s words for yourself. Under the apple tree beneath God’s blue sky. Under the apple tree with the sun peeking through. Under the apple tree just Him and you. Under the apple tree, when He tells you that He loves you. Under the apple tree, when His peace surrounds you. Under the apple tree, when His grace covers you. Under the apple tree, when your cares fade away. Under the apple tree is when you know God is real. Peter said to them in Acts 2:28, “Repent”, and let every one of you be baptized in the name of Jesus Christ for the remission of sins; and you shall receive the gift of the Holy Spirit. Peter states three things we must do and gives us the order in which we must do them. First, he tells us to repent, be baptized in the name of Jesus Christ, and receive the gift of the Holy Spirit. 1. Repent – The word repent means: to feel sorry, to change one’s way or to change your mind, to start thinking and acting different than before. 2. Baptize – To be submerged in water. We have to go under water, as to die unto self and to come out as to rise up with Christ-in the name of Jesus Christ. For we cannot be baptized in the name of Jesus Christ or receive the Holy Spirit if we have sin within us. We must repent of our sins because the Holy Spirit cannot come in where sin lives. The Holy Spirit cannot live where sin is or around sin. Now that we have repented and emptied our sins, we need to put something within us. And that something would be the Holy Spirit. A person can’t be cleansed of all sins and left empty. Next, we should be baptized in the Name of Jesus Christ and He will wash us clean. The Bible say’s Jesus washes us “As white as snow”. After we are emptied; we’re now clean. Now let’s go to the next step. The Holy Spirit has to come inside of us. Now the Holy Spirit can work in us. The Bible tells us what happens when a person repents and does not have the Holy Spirit-not the prayer of salvation. We can be saved without receiving the Holy Spirit but we cannot have the Holy Spirit without being saved. When we repent, empty our hearts from all sin. Be baptized in the name of Jesus Christ. Jesus comes in and sweeps the dirt away that was in our hearts. He puts in order all our thoughts (the way we should think about things), the way we talk, act and feel. Then we receive the gift of the Holy Spirit that comes and lives in us. We are no longer empty. Our house (heart) is filled with the Love of Jesus Christ. Now when satan (the unclean spirit) comes back, he finds someone living in the house. (The Holy Spirit now lives in our heart). Satan cannot live where the Spirit of God lives. Here is an example: Let’s say we have food poison and the doctor is going to pump our stomach first, to take out the poison. Then, he gives us medicine to counteract the damage that was done. He sends us home with more medicine that will help us get our strength back. Like in the natural, so it is in the spirit realm. You first repent, then Jesus cleans and the Holy Spirit strengthens us. It is just like this: A doctor will not come to you and ask if something is wrong. You have to go to the doctor. Likewise, God will not come to you and say you need to repent; you will have to come to Him and tell Him that something is wrong. I pray that God’s love fills you and His peace surrounds you. This book will help you understand what prayer is and how to make prayer work in your life. Hear the word of the Lord, O people of Israel! The Lord has filed a lawsuit against you, “there is no faithfulness, no kindness, and no knowledge of God in your land. You curse, you lie, you kill, and you steal, and commit adultery. There is violence everywhere, with one murder after another. That is why your land is not producing richness. It is filled with sadness, and all living things are becoming sick and dying. Even the animals, birds, and fish have begun to disappear. But we have hope in the promises of God. For [then] He will deliver you from the snares of the fowler and from deadly pestilence. His faithfulness promises you armor and protection. Do not be afraid of the terrors of the night, nor fear the dangers of the day, nor of the pestilence that walks in darkness, nor of the destruction that lays waste at noonday. Though a thousand fall at your side, though ten-thousand are dying around you, these evils will not touch you. But you will see it with your eyes; you will see how the wicked is punished. If you make the Lord your refuge, if you make the Most High your shelter, no evil will conquer you; no plague will come near your dwelling, for God orders His angels to protect you wherever you go. In their hands they shall bear you up, lest you dash your foot against a store. You will tread upon the lion and poisonous snake; you will crush young lions and serpents under your feet! The LORD says, “I will rescue those who love Me. I will protect those who trust in My Name”. When they call on Me, I will answer; I will be with them in trouble. I will rescue them and honor them. I will satisfy them with a long life and give them My salvation. It all started on a Wednesday, September 9th. I wanted to get some candles for a friend, whose brother had pasted; she had picked out the color of blue she wanted. I thought that color would be hard to find. As I was getting dressed to go to the store, I asked God to help me to find the perfect candles (and in my spirit, I heard “right around the corner”). However, I used my own understanding, as to what was “right around the corner,” and went to a store in a nearby town. I did not have much money to spend on candles, so I had to find a store that would have them at a good price. I didn’t find any candles at that store. Coming back, “right around the corner” from my house I saw a store that was the sister store to the one I had just left. I went in and all they had were two blue candles, just the color blue I needed. I was looking for two blue and two white candles. I knew that white candles would be easier to find but the exact color blue may be harder to locate. But there they sit, two blue candles, in the perfect color “right around the corner”. Many things were going on in my life at that time. My best friend’s brother had died on September 2nd and his funeral was the reason for the candles. I also had two other dear friends making plans to move to New York and I wanted to give them something special to take with them. The husband had been impressed by the wok we’d fried some fish in. I explained to them that the wok was very old and I don’t know if they made this kind anymore. I really wanted to give them our wok as a going away present since they liked the way it cooked. Later as I was doing some reading, I opened the Bible, and on a sheet of paper inside were the words, “HOLD STILL AND KNOW THAT I AM GOD.” I took this as a sign that God was talking to me. Later that night, after my husband came in from work, we started to read from the Bible and there was the verse; “HOLD STILL AND KNOW THAT I AM GOD” from Psalm 46. I was convinced now that God was talking to me. A little while later, we left to visit my friend’s house that was going to New York. That very night she says to me, “HOLD STILL AND KNOW THAT I AM GOD.” She told me that, it is a message from God to you. I told her that it was a “conformation.” This all happened between Wednesday the ninth from about 10:30 p.m. and Thursday the tenth. Walking in the thrift store, I saw some shoes that I liked but I told myself I would stay on track for what I came in the store for. Thereafter, I walked to where the pots were located. There I saw two red tops to a wok (my wok is red and black with the top and the outside of the wok being red). One wok top had no bottom, the other complete wok was an updated version, from the one I had, and it cost more. I was thinking about buying that one while still looking for the bottom to the other top. In the store, a man came up behind me. I did not hear him or see him coming. It was as if he just appeared there. He said to me “it is a good buy” and I said “yes” and then he reached over and picked up the top to the bottomless wok and I said to him, “it didn’t have a bottom” and he said, “Yes it is here somewhere.” Amazingly right where I was looking, he picked up the bottom to the wok. Now remember, the bottom is red not a hard color to miss. Not only did he find the red bottom but the identical wok I had at home. It was cheaper than the other one and was like new and never used. It was like buying a new wok for my friends, just what I wanted to do. The wok came with all the parts and the book, which looked new. I knew it had to be God. I went to check out and as the salesperson was putting the wok in a bag, I said, I will be right back and I went back to where I found the wok and the man that was helping me came back and said to me again, “it is a good buy.” He was standing on my right side but when I turned to answer yes, he now appeared on my left side. Where he came from, I do not know. Now the store is arranged in such a way that I would have seen him coming up from behind me. However, there he was, on my left side, so I started telling him how the Spirit had sent me to this store. Then he said to me, “You talk to the Spirit?” and I said, “No, I listen to the Spirit.” Then looking right into my eyes, he softly said, “LOOK AT ME, LOOK AT ME, WHAT DO YOU SEE” and I just looked at him. Then he said it again, “LOOK AT ME, LOOK AT ME, WHAT DO YOU SEE.” So then, I asked him what do you mean and he said, “I have nothing and everything I get I lose.” I said to him, “I am not a prophet and I cannot tell you what will happen with your future.” I do know we have a God that will give you all that you need, if you just believe in Him. He told me his name was Kevin. I went on to pray with him, “the prayer of salvation.” I prayed that, God would wrap His wings around him and let him know that He is with him, to give him peace that surpasses all understanding. I looked up at him and he was crying. I told him he would be a testimony. Then his boss called him back to work. On Wednesday September 16th, five days later, I went back to the store to give Kevin my book on prayer. When I got back to the store, no one really knew whom I was talking about. All I could find out was that, there was a man who comes in every so often. The thrift store seemed very different from before. The part of the store where our conversation took place did not look the same at all. In the store, there were only a few familiar things. It was hard to believe that I was in the right place. No one in the store knew Kevin and the man thought to be Kevin had not been around in a very long time. Little did I know what kind of a testimony it would really be? 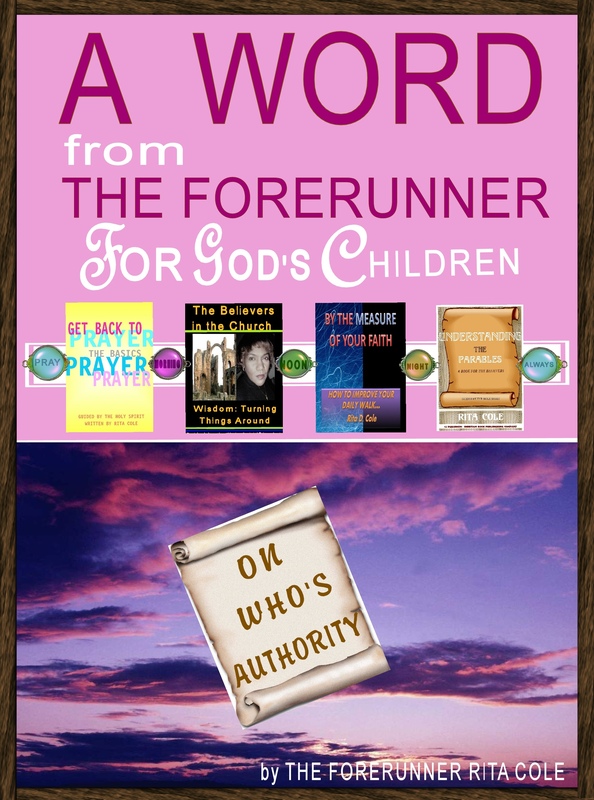 I am a Christian Author and Forerunner for God’s Word. A few years ago, God gave me four books all at one time. God made me an author.